Let me know if it works (or doesn’t)! Edit: updated to work with image urls ending in ?format=original (or any query string after the image name for that matter). Just released a new plugin for any fellow WordPress developers out there, it adds a contact form to the dashboard area of the back end of your or your clients’ websites so that they can contact you right from there. More or less it’s a great way to keep clients even years later where they can quickly turn to that support box for support. 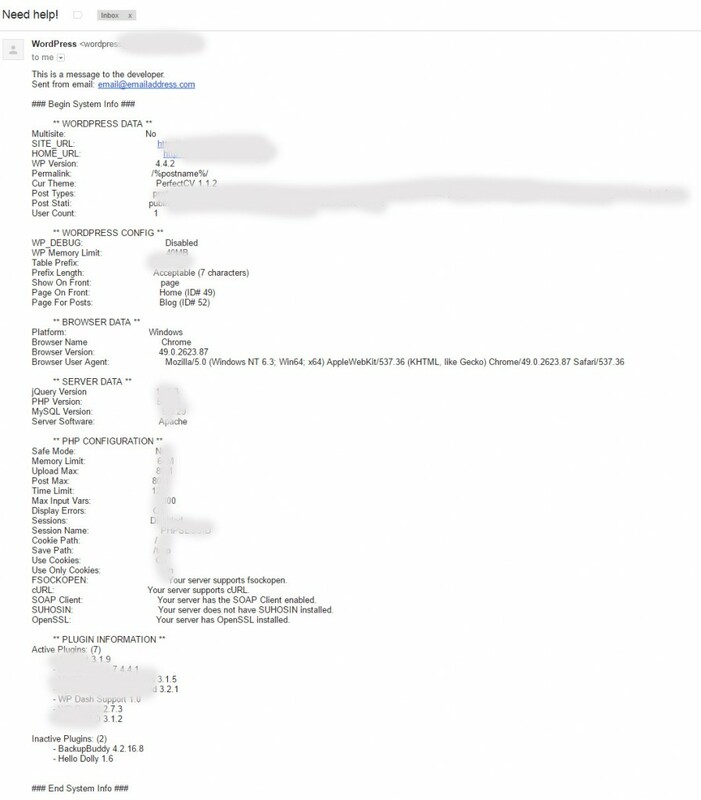 You can see a picture below of what the email you get from them looks like, it includes a bunch of diagnostic info that should be helpful like their WordPress version, active plugins, PHP version, MySQL version and more. It even shows you what browser they are using in case it is a browser specific thing. Hopefully it will be a help for some of you out there looking for something like this. Need someone to make my plugin work for your site? I’m looking for one or two customers to help build out my plugin – in return I only ask that you help me correspond with TREB to get some additional features implemented and some questions answered. If this post is still up this offer still applies! This is a plugin I made for the AIT Directory WordPress theme that will give you an option to make listings featured and show them at the top of listings as well as add a CSS class to let you style them separately from the other items.